How can you determine whether you are viewing a sampled GA report? When Google Analytics starts sampling the data? 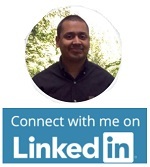 How you can fix the data sampling issues? In the context of Google Analytics, Sample (or sampled data) is a subset of traffic data. It is not a complete traffic data set. Data Sampling is the process of selecting a subset of traffic data for analysis and reporting, on the trends detected in that subset. Data sampling is widely used in statistical analysis to analyse large data sets in a cost efficient manner and in a reasonable amount of time. As long as the sample is a good representative of all of the data, analysing a subset of data (or sample) gives similar results to analysing all of the data. But if the selected sample is not a good representative of all of the data or if selected sample is too small then analysing a subset of data does not give similar results to analysing all of the data. Google Analytics has an upward limit on the amount of traffic data it will not sample to produce reports. This limit has been set to save resources (computation power and cost). 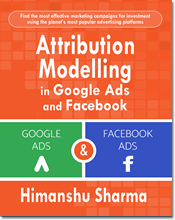 Google Analytics may choose to analyse the complete traffic data set or only a subset of traffic data depending upon the nature of a user’s query. When GA start analysing only a small subset of traffic data, you can’t rely on the metrics reported by it, as the selected sample may not be a good representative of all of the traffic data. Smaller the sample size, more inaccurate the reported traffic data becomes. Ideally you would want GA to analyse complete traffic data set every time you query the traffic data. If that is not possible then let it analyze biggest possible sample size to minimize data sampling issues. 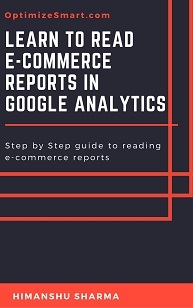 What that means, if you change the size of the data sample being analysed, your e-commerce conversion rate could change, the revenue reported by Google analytics report could change. If you have got data sampling issues, any or all of your reported metrics from: ‘sessions’, ‘users’,’pageviews’, ‘bounce rate‘, ‘conversion rate’, to ‘revenue’ could be anywhere from 10% to 80% off the mark. 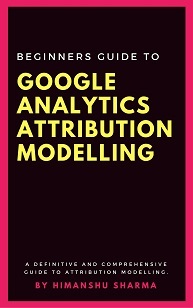 For example Google Analytics may report your last month revenue to be say $1.2 million when in fact it is only $950k. You can determine such data discrepancies by comparing a sampled report with its unsampled version and then calculate the percentage of difference between various metrics. Make sure that the difference is statistically significant before you draw any conclusion. You need a high accuracy in traffic data. Any marketing decision based on inaccurate date would not product optimum results and may also result in monetary loss. As long as your report is based on 100% of the sessions, the reported data is unsampled. 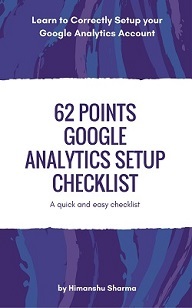 If your report is based on less than 100% of sessions than you have got data sampling issues. Lower the sample size, greater is the data sampling issue. For example, a report which is based on 45% of sessions has lower sampling issues than the report which is based on just 4.58% of sessions. Select ‘Faster Response‘ if you don’t mind sacrificing data accuracy for speed i.e. you want GA to quickly load the report even when it means smaller data sample being used for analysis. Select ‘Greater precision‘ if large sample size being used is more important for you than speed i.e. you want GA to use large data sample even when it means, the report will load slowly. I would suggest to always use ‘Greater precision’ settings. Here you drag the button to left for faster processing and loading of a GA report or to the right for higher precision but slower loading of a GA report. Note: You can receive sampled data even when you are using Google Analytics API. Data sampling depends upon the type of user’s query and sampling rate can vary from query to query. Each GA view has got a set of unsampled and pre-aggregated data which are used to quickly display unsampled reports. A user can query the GA data via the reporting interface or via the API. If the query can be wholly satisfied by the existing unsampled and pre-aggregated data then GA does not sample the data otherwise it does. A user query can be standard or ad-hoc. A standard query can be something like requesting a report for a particular time period or running a report for a particular dimension. Any user’s query which can be wholly satisfied by the existing unsampled and pre-aggregated data is a standard query. Any ad-hoc query can not be wholly satisfied by the existing unsampled and pre-aggregated data. Applying advanced segment and/or secondary dimension to a custom report. 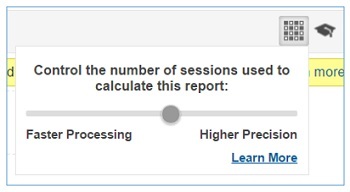 If the resulting report from ad-hoc query is sampled, then you will see following message at the top of your report: “This report is based on less than 100% of sessions). If the ad-hoc query can be wholly satisfied by the existing unsampled and pre-aggregated data than GA won’t sample the data. In other words, GA won’t always sample the data just because you have applied advanced segment or secondary dimension to a standard report or just because you are running a custom report. The probability of GA to sample the data increases when a user query is based on more than 500,000 sessions (in case of GA standard) or more than 25 million sessions (in case of GA premium). But if the user query can be wholly satisfied by the existing unsampled and pre-aggregated data than GA won’t sample the data even if the query is based on more than 500,000 or 25 million sessions. In other words, GA won’t always sample the data just because the query is based on more than 500,000 sessions or 25 million sessions (in case of GA premium). Thus data sampling depends upon the type of user’s query and sampling rate can vary from query to query. GA reports data in the form of tables. The data in these tables are either pre-aggregated or aggregated on the fly depending upon the user’s query. Each data table is made up of rows and columns. Each dimension can have number of values assigned to it. Cardinality is the total number of unique values available for a dimension. For example, the dimension ‘device category’ has got 3 values: desktop, tablet and mobile. Some dimensions like ‘keyword’ or ‘page’ can have hundreds or tens of thousands of unique values assigned to it. Such dimensions are known as high-cardinality dimensions. 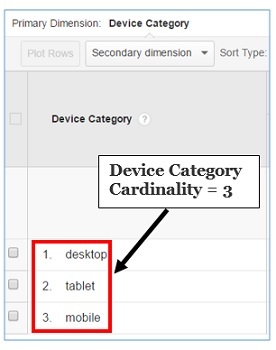 Google Analytics reports which contain high cardinality dimensions are sampled if you see ‘(other)’ row in a report. #1 Visit Tables – Unsampled reports are generated from the visit tables. Visits table is used to store raw data about each session. #2 Processed Tables (also known as aggregate tables) – It is used to store pre aggregated data for commonly requested reports. Processed tables allow commonly requested reports to be loaded quickly and without sampling. Note: When a user’s query can’t be satisfied with existing processed tables, GA uses the visit tables to report on the requested information. Single day processed table contains 1 days’ worth of data. These tables are processed daily and are also known as daily processed tables. A single day processed table can store upto 50,000 rows of unique data (dimension value combinations) in case of GA standard and up to 75,000 rows of unique data in case of GA premium. If a GA premium user is using custom tables then a single day processed table can store upto 200,000 rows of unique data. 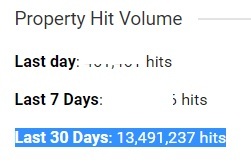 When a user’s query break these data limits then the reported data is being sampled and GA roll up the lower volume dimension value combinations into the (other) row. These are the data limits for daily processed tables. However bear in mind that these are all reporting limits for single day processed tables and are not processing limits. Google Analytics is still tracking all those lower volume dimension value combinations which are rolled up into the (other) row and are thus not displayed in reports. Since single day processed tables are processed daily, a page/keyword that was rolled up into the (other) row one day, may not necessarily be rolled up into the (other) row the next day. Multi-day processed table contains multiple days’ worth of data. These tables are processed for multiple days and are made from multiple single day processed tables. A multi-day processed table can store upto 100,000 rows of unique data (dimension value combinations) in case of GA standard and up to 150,000 rows of data in case of GA premium. These are the data limits for multi-day processed tables. When a user’s query break these data limits then the reported data is being sampled and GA roll up the lower volume dimension values into the (other) row to stay within the data limits. However bear in mind that these are all reporting limits for multi day processed tables and are not processing limits. In addition to data limits for single day and multi-day processed tables there are also report query limit . The report query limit is that, for any date range, GA returns a maximum of 1 million rows of data for a report. In addition to data limits for single day and multi-day processed tables and report query limit there is also conversion paths limit. The conversion path limit is that, on any given day, GA returns a maximum of 200,000 unique conversion paths in a report. You will also notice that your GA reports take too long to load in your web browser. #2 When a user’s query is ad-hoc i.e. it can not be wholly satisfied by the existing unsampled and pre-aggregated data. #3 For GA Standard, data sampling of non-multi channel funnel reports occurs at the property level. So view filters can impact the sample size. #4 For GA premium, data sampling of non-multi channel funnel reports occurs at the view level. So view filters do not impact the sample size. #5 In case of multi channel funnel reports sampling occurs at the view level whether you use GA standard or GA premium. So view filters do not impact the sample size. #6 When a user’s query breaks the data limits for a single day or multi day processed tables. #7 When a user’s query breaks the report query or conversion path limit. 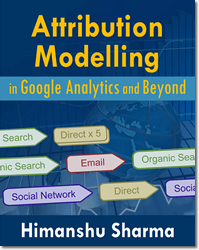 #8 When you view a multi channel funnel report which has got more than 1 million conversions. #9 When you view a flow visualization report (users flow or goal flow) that is based on more than 100k sessions. Note: It is a common misconception that low traffic websites do not face data sampling issues. They can also face data sampling issues depending upon the type of user’s query. #1 Always keep the data sampling setting to ‘Greater precision’. The larger the data size being sampled, the more accurate the traffic estimates are. On the other hand, smaller the data size being sampled, the less accurate the traffic estimates are. But here is one caveat. There is still an upward limit on how big you can make the data sample in Google Analytics. Avoid applying advanced segments and/or secondary dimensions to your standard reports when you are analyzing metrics esp. 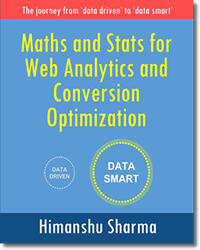 ecommerce metrics like ‘e-commerce conversion rate’ and your analytics account has got data sampling issues. 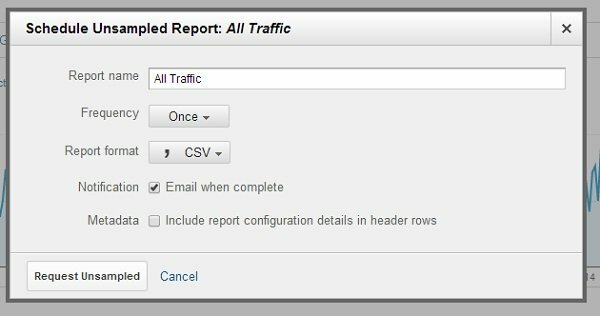 Run your GA report in such a way that you always see following message at the top of your report: “This report is based on 100% of sessions. If that is not possible then run your report in a such a way that your report is based on biggest possible percentage of total website sessions. In this way you can minimize data sampling issues. downloading the report into excel and then do all the advanced segmentation and calculations there. Since for standard GA, sampling occurs at the property level, consider tracking different sections/sub-domains of your website via different properties. You can’t rely on free versions of the analytics tools for large amount of data processing and high accuracy. The data sampling limit of GA premium is approx. 200 times than that of standard GA which means you get more unsampled data in GA premium than in GA standard. GA premium can handle websites which get 1 billion+ hits /month as opposed to just 10 million hits per month supported by GA standard. However GA premium will cost you $150,000 per year. I have been using GA premium for quite a long time now and I get lot of emails from people asking about its capabilities and whether $150k /year spend is really worth it. If your monthly online sales is at least $1 million and/or your website gets more than 10 million hits/month then you should definitely invest in enterprise level analytics software like GA premium. From my experience it is hard to justify $150k/year spend on an analytics tool if the online sales is less than $1 million per month. If your website gets more than 10 millions pageviews/hits each month but you can not afford to use GA premium then you will have to lower the data sample rate to stay within the GA processing limits for a standard account and avoid violating Google Analytics TOS (terms of service). According to Google Analytics TOS, you should not use GA standard, if your website gets more than 10 million hits per month. If you violate the GA TOS, then GA may stop tracking your website data any day, any time. You can lower the data sample rate by using the ‘Sample Rate’ field with the ‘create’ command. Here I have set the data sample rate to 50%. What that means, is that website usage data will be collected only for 50% of your website visitors. The website usage data for the other 50% of your visitors won’t be tracked and reported. 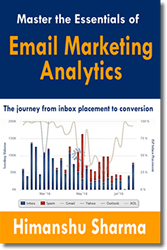 Of Course you will get muddy analytics insight by lowering your data sampling rate. But then getting some analytics data would be better than nothing at all. I do not recommend lowering the data sample rate. Note: The default value of sample rate is 100. Piwik is a free open source analytics platform. #1 You actually own your analytics data. #2 Matomo allows tracking of PII (Personally Identifiable Information) which can be very useful for some businesses and projects. #3 It has got a plugins architecture and an open marketplace: this brings almost infinite possibilities of innovation by the community. #3 Matomo does not sample the data. #4 Matomo does not have any data sampling limit. Yes you heard it right. This is because all of the data resides on your server. #5 There is no limit to the number of goals you can track. 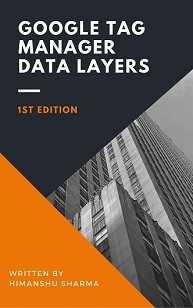 #6 There is no limit on data storage and data collection. Analytics canvas can help you in reducing/eliminating data sampling programatically by using query partitioning. In query partitioning, a user’s query is broken into multiple queries in such a way that each individual query does not trigger data sampling. 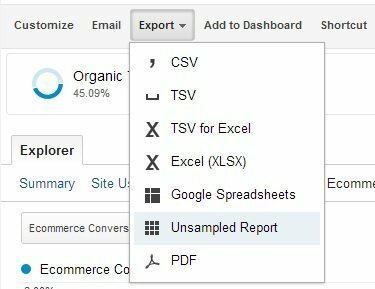 Step-1: Navigate to the report for which you want unsampled data. Note: Unsampled Reports are available only in GA premium. Step-3: Name the report, select the frequency and click on the ‘Request Unsampled’ button. Step-4: Now click on the ‘customization’ tab > “Unsampled Reports” to see your requested report and the availability status of the report (pending, completed). Once the report is available for download, click ‘csv’ to download the report.